Instead of handing out a heavy pile of research, he chooses to remains an agile writer, commenting on complex issues through a series of intimate vignettes. Near the end of Better, Atul Gawande takes us inside a pediatrician's office. And like the rest of the book, the context is well researched, but it's the tender details that make it work. The physician is an expert in treating cystic fibrosis, a genetic condition that requires highly specialized care. He is seeing a 17-year-old high school student, Janelle, with "dyed black hair" and "Avril Lavigne eyeliner." She has been his patient for over 10 years. They talk about school, jobs, boyfriends, and, of all things, lung function. And when he finds out that she has not been taking all of her medications because a new rule mandates that she see the school nurse each time ("The nurse won't let me"), he says plainly, "Don't tell her." It is a simple exchange between a doctor and a patient, but one that reverberates so many other issues, including chronic disease, adolescent rebellion, and continuity of care -- and it is precisely the type of exchange that makes Gawande one of the best storytellers in medicine. But, as is always the case, Gawande's purpose is much grander. He tells us that when this physician started practicing, over 50 years ago, the average cystic fibrosis patient died before the age of three. Now, with early diagnosis and innovative treatments, his patients have a good chance of living into their 30s, 40s, or beyond. (His oldest patient is 67 years old.) It certainly is a success story. But what about the cystic fibrosis centers that do not fare as well? What about the physicians with higher complication rates? How are they trying to do Better? 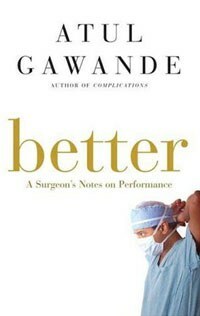 Throughout his excellent new book of case studies, Better: A Surgeon's Notes on Performance, Gawande digs deep to answer these questions, deftly exploring how success in medicine is assessed and achieved. If you thought of American physicians like one enormous overachieving family, Gawande would be the independent and idealistic older brother. He is a member of the first professional generation of physicians, like myself, that persisted despite cautions by our elders that "they would never have gone into medicine had they known what they know now." There is no doubt that he treasures the opportunity to recognize as well as set good examples in medicine. And as he rightly puts it, "Betterment is a perpetual labor," one that requires both personal introspection and professional exploration. Some people would consider this level of idealism surprising for a surgeon. However, if you have ever read Gawande, it is what you have come to expect. Ever since his days as a medical student at Harvard, he has consistently demonstrated compassion for public health and a tender touch with the pen. The beauty he sees in the human experience is revealed in his stories of otherwise forgotten conversations, like that of an English teacher with breast cancer and her young surgeon waiting for an operating room to become available. His first book, Complications: A Surgeon's Notes on an Imperfect Science, was a finalist for the National Book Award and can be regarded as a model of its kind. So, in many ways, Better is just more vintage Gawande. Like Complications, Better is based around original and previously published stories (he is a staff writer for The New Yorker) loosely grouped into three parts. Each section takes stories from around the world to look at what he considers the main components of the struggle for success: diligence, doing right, and ingenuity. The stories he shares are interesting and wide-ranging, with a human element that really shines. In profiling extraordinary examples of diligence, he rides along with Dr. Pankaj, a World Health Organization pediatrician "with a slight paunch and an easy, genial manner" on a polio immunization campaign in rural India. He speaks with a colleague who served as a surgeon in Iraq who wondered "what [he] had gotten [himself] into." In probing the tough ethical dilemmas in medicine, he speaks with a physician who participates in lethal injections because it "seems wrong for us to walk away, to abdicate our responsibility to the patients." And, in each chapter, we are rewarded by his thoughtful reflections on personal and professional responsibility. Better is not a book only for physicians. While medical professionals are Gawande's subjects of Betterment, the circumstances they face involve us all. As he shows us in the conversation between Janelle and her cystic fibrosis specialist, Gawande has a talent for gracefully elucidating the issues that matter. Instead of handing out a heavy pile of research, he chooses to remains an agile writer, commenting on complex issues through a series of intimate vignettes. If there is any criticism of Better, it is its lack of answers. But that is exactly Gawande's point. Our society is one where we "hope for an easy fix," and he is careful not to minimize nor glorify the complexities of each situation. For instance, in the opening chapter "On Washing Hands," he investigates what is by turns both one of the greatest public health discoveries and a gaping failure. It is simple: washing hands drastically decreases the rate of infections. But, as he explains, getting doctors and nurses to do it is not so easy. Medical residents often have to see 20 patients in an hour, and if recommendations were followed, a third of their time would be spent just washing hands. After adopting the use of an alcohol-based sanitizing gel at his hospital the rates for "proper hand hygiene improved substantially: from around 40 percent to 70 percent." (Yeah!) But, as he cautions, "infection rates did not drop one iota". (Oh.) Although he goes on to explain the challenges in more detail, therein lies the lesson of Better: Success is difficult to measure, even harder to achieve, and is almost always a team effort, requiring "a hundred small steps [to] go right." But we must always try. Because only then will we all do better.